Reverence for the goddess is becoming prevalent in our day. The goddess is embraced by witchcraft, radical feminism, the occult, and the liberal church. The New Age that is about to dawn upon us will be, according to the occult world, a feminine age. Likewise, those who hold this view believe that this current, masculine age has been an age of destruction and broken relationships among humanity. The New Age with its feminine energies will bring balance to the destructive aspects of the Piscean Age. In order for this feminine age to come into full fruition, a shift in consciousness must take place in the world. This shift in thinking and perception of reality will bring forth the goddess. Christians must be aware that when the moon is full, writers, teachers, nurses, computer programmers, artists, lawyers, poets, plumbers, and auto mechanics—women and men from varied backgrounds—gather on hilltops, beaches, in open fields, and in ordinary houses to invoke the mother goddess and her consort, the “Horned One,” by their varied names. 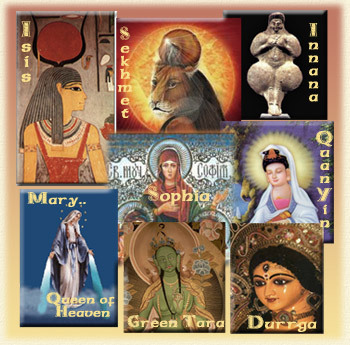 The Sophia Circle and Isis: "Queen of Heaven"
Throughout history, various forms of goddess worship has played a significant role in our world’s religious and cultural makeup. Today, goddess veneration is still very much alive and well, and images of the goddess–in various forms–can be identified in every state and province. Satan has tirelessly thrust the deities of ancient Egypt upon mankind for thousands of years. Ultimately though, it doesn’t really matter if "she" is called Sophia, Isis, Diana, Virtus, Cybele, Rhea, or Mother Mary, the concept is always the same–the lifting up of a pagan goddess as a replacement for the true God. The Labyrinth.. a Return to the goddess? is a revival of Paganism that rejects Christianity, considers Christianity its biggest enemy, and views the Christian faith as its only obstacle to a global religion centered on Gaia worship and the uniting of all life forms around the goddess of "Mother Earth". A cunning mixture of science, paganism, eastern mysticism, and feminism have made this pagan cult a growing threat to the Christian Church. Gaia worship is at the very heart of today's environmental policy. A spiritual renaissance is sweeping through churches and seminaries, The the ancient religion of the Earth Mother is bringing pagan empowerment rituals and texts such as Mother Earth Spirituality. This unholy renewal lures children as well as adults, atheists as well as Christians. No part of our culture is immune. Look at the signs of change in our schools and media. Many Christians who still hold membership in denominations which are a part of the WCC, which is about par for the course in this day and age. With their involvement in goddess worship, paganism, ecumenism and every other conceivable form of deviancy, The WCC is one of the worst of the apostate bodies claiming to be Christian. If only God's people would wake up and see how the world council of churches is using the churches to destroy the very foundations of faith and freedom.